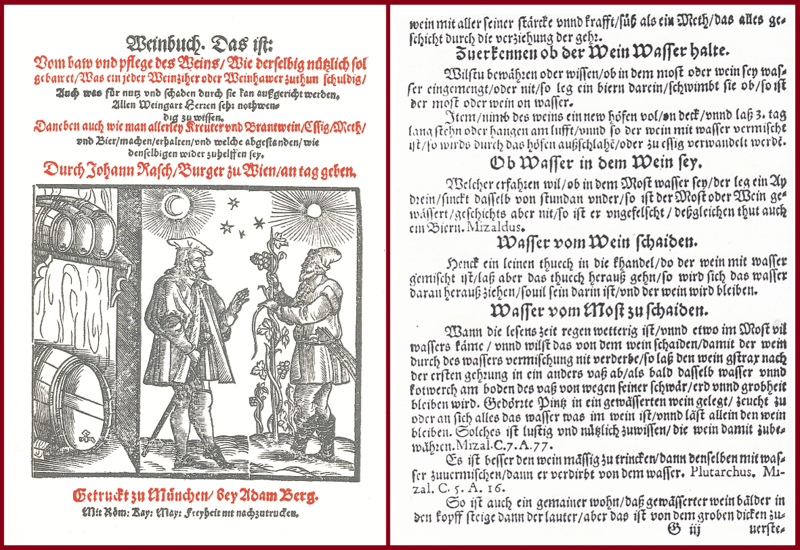 Under Weinverfälschung or colloquially also Panchen is understood quite deliberately and intentionally against wine law Prohibited, incorrect manipulation of the winemaking that are carried out in deceptive or fraudulent intent. It should be prohibited by the addition of the taste or the quality "improved" and thus falsely faked a certain or better quality, the quantities of high quality cry by mixing with simple, cheap produced mass wine or just with water stretched, as well as by false labels even using genuine labels and / or bottles of wines under prestigious names or vintages be marketed. In the history of winegrowing, there are always different and often changing views on the question of what exactly has to be considered as wine tainting. What today is considered as Pantscherei was maybe a few decades ago a widely practiced practice. Even today, some techniques are country specific and especially in Europe opposite the New world regulated differently. Three significant examples are the provisions regarding enrich. leavening and sweetening, The introduction of strict wine laws in many wine-producing countries beginning with the end of the 19th century had a positive effect. For individual wine-growing areas, they already existed before. Of course, it was not possible to completely prevent manipulation. Especially the 18th is considered the "century of the wine scandals ". The enormous demand in England for port wine led from 1730 to bottlenecks. Therefore, at the Douro easier wines with alcohol, Elderberry juice, ginger. pepper. cinnamon and sugar added. The positive effect was that in 1756 the Port wine area was declared one of the first protected areas and strict laws were passed. in the Bordeaux It was widely customary to blend the wines for the English market with alcoholic, simple wines from other areas (Rhône, Spain). As in France by the Reblaus- and mildew Plage There was a large shortage of wine, which became abundant in 1880 raisin wine manufactured. In the 19th century there were large numbers of counterfeits of the Hungarian in many countries Tokay In books there were even detailed recipes for it. The big breakthrough in the fight against counterfeiting began with the definition of controlled origin or Origin designations, These are starting from France with the appellation system originated from the beginning of the 20th century. Of course, there were still wine refinements and dandruff with ever more refined and difficult to verify methods. Even the counterfeiters benefit from new scientific findings. One particular form of fraud is to falsely market wines under a prestigious name or winery and / or special vintage. One motive is that very expensive wines increasingly used for capital investment, for which there is a market especially in Japan and Russia. Such buyers are ready to join Auctions To pay lovers prices. Already the Greeks in the pre-Christian antiquity knew the preserving effect of the Schwefelns but still in the 15th century the addition was banned and severely punished in case of non-compliance. The most common manipulation techniques have always been the acidity, the Sweet and the colour of the wine to "improve". For a variety of substances such as lime, lead acetate. grape. bovine blood. salt and sugar used. The spiritual Johann quickly (1540-1612) gave in the 1580 published "Wine Book: From Baw, care and custom of wine" already advice on how to detect wine counterfeits such as the addition of water. Already in ancient Rome it was customary, simple wine of other areas than prestigious Falernian issue. Today wines are bottled in original bottles with original labels, because the profit margin is very high even with small quantities of fake wines. But with today's resources, it's relatively easy to make deceptively real labels (scanning the original and changing the year). Using genuine bottles and labels, even a newly developed method does not help to determine the age of bottle glass. However, very well, if no original bottle, but only original labels were used. The most common counterfeiting practices are new production, label fraud and refilling. New production means the fact that Wine. bottle. cork. capsule and label new were produced and nothing is original anymore. It also happens that sometimes real bottles, capsules or labels are used. When labeling vertigo is a weaker vintage made a special vintage, simply by changing the label is (for example, with a Château Lafite-Rothschild Happened 1991, which mutated to a Jg. 1982). In older vintages are often wines from lesser known wineries of a large vintage or the second wines of famous châteaux with the label of Erstweins newly labeled. In this case, the capsule is correct, the bottle is from the period of the wine mentioned on the label, also the soiling, the vintage brand and the age of the cork match the original. When refilling a qualitatively weaker wine is filled in the original bottle. A cork can be pulled undamaged out of the bottle by means of a special bottle opener. There is already a market for bottled utensils of prominent wines. New capsules can be bought online. For empty bottles of z. Château Lafite-Rothschild, for example, is paying $ 500 in China and reselling it with dubious content. In the detection of counterfeiting play the bottle shape (the bottleneck of old bottles is often conical, seam indicates machinability), Bottom Bottom (In the mid-1990s, a hole was drilled in the subsoil by microscopic drill, the wine emptied by pump, then refilled with new other wine and the bottle closed by means of special glass glue), the condition of the glass, the filling level (which refers to the age), the colour the bottle (certain wineries use certain colors and shapes) that label and the state of cork a role. The challenge is to examine the wine without opening the bottle. For this purpose, the cork is pierced with a thin needle and a small amount of wine taken. Traces of radioactivity may indicate, for example, that the wine was produced after the atomic bombs dropped on Hiroshima and Nagasaki in 1945. In France, a procedure was developed to verify the authenticity of old wine bottles. Scientists from the "Régional de Caractérisation par Analyze Nucléaire Elémentaire" announced in autumn 2008 that the origin and age of bottle glass can be determined by means of high-energy ions. There were 160 older rarities of the famous London trading house Antique Wine Company analyzed. In cooperation with the university, this company now offers the testing of old bottles as a service. The detection of illicit practices is increasing DNA analysis developed. Researchers of INRA made a breakthrough in 2002 by conducting the analysis process Nuclear Magnetic Resonance developed. This can be used to determine if a wine flavorings were added. As a measure against manipulation was from Ornellaia the first time RFID system used. A new analytic method called metabolomics was tested at the Max Planck Institute. In the award of the Official test number (Germany) and State test number (Austria) plays bez. possible wine manipulation the relative density measurement an important role. A comprehensive diploma thesis was published by Thomas Breitwieser in June 2008 under the title "Wine Counterfeiting - Guide to Recognizing Wine Plagiarism" . He runs the website "Lust auf Wein" . Certain contents of the diploma thesis were also used as source. The most spectacular wine counterfeits of modern times are under wine scandal as well as under Hardy Rodenstock and Rudy Kurniawan cited. The question of which methods or use of certain medium have to be considered as wine taint, won by the valid from 2006 wine trade agreement between United States and European Union at explosive topicality. In this regard, comprehensive information is under the keyword wine law, Complete listings of the numerous vinification measures and cellar techniques, as well as the wine-regulated wine, sparkling wine and distillate types are under winemaking contain. This page was last modified at 20 January 2019 at 17:52.